Art sets no boundaries and limits, it understands that real freedom lies in authentic expression and that is why the act of creation is such a liberating experience. 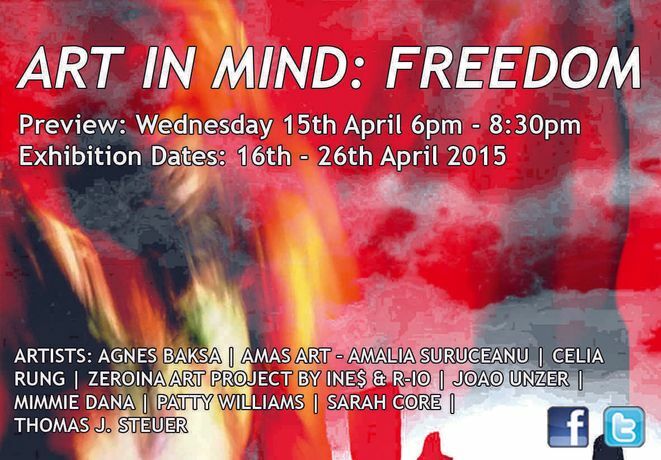 In our new exhibition ART IN MIND: FREEDOM we gathered works of nine artist from Brazil, Sweden, Germany, Switzerland, Romania, Hungary, Italy and UK; these artworks show the pure joy of creating and focus on definition of freedom shedding some light on its many aspects. To own your body and to be able to speak your mind freely – is every human’s birth right. Unfortunately, this freedom is being taken away from people all across the world. Brazilian artist Joao Unzer, in his daring graphics shows the misery of human existence when he loses the power over his life and cannot free himself. The problem of control appears also in Patty Williams’ impressive sculptures horses heads made from mosaicking materials. Horses are naturally wild animals, and yet, they can be domesticized by humans. The wilderness and need of freedom always remains within them. This also refers to humans, as living in fast and stressful world, sometimes we need to let go and set ourselves free. Horses gallop and humans dive within the nature. Romanian artist, Amalia Suruceanu understands the liberating and relaxing power of nature. Her vibrating, and yet, soothing landscapes, confronts the audience with blue-watered seas, boats swayed by waves, and forests filled with sun softly gazing through the trees. The freedom of being who we are, and expressing it with our unique voice is the true art. We would like to invite you to our opening night on Wednesday 16th of April. You will have a chance to talk to artist and enjoy their art over a glass of wine.